One can’t miss Chef Ritu Dalmia’s inimitable magic in the recently opened Diva Spiced. The original diva for Italian food in Delhi, Chef Ritu’s passion for good food finds suitable expression in oriental fare at this outlet. This all-day dining serves modern Asian cuisine made with fresh ingredients and often an unpredictable twist to traditional favourites. Take your pick from Tapas and Salads, Rice and Noodle Bowls and an extensive choice of mains. Although a liquor license is expected soon, there is a good choice of mocktails, smoothies, fresh juices, tea and coffee. 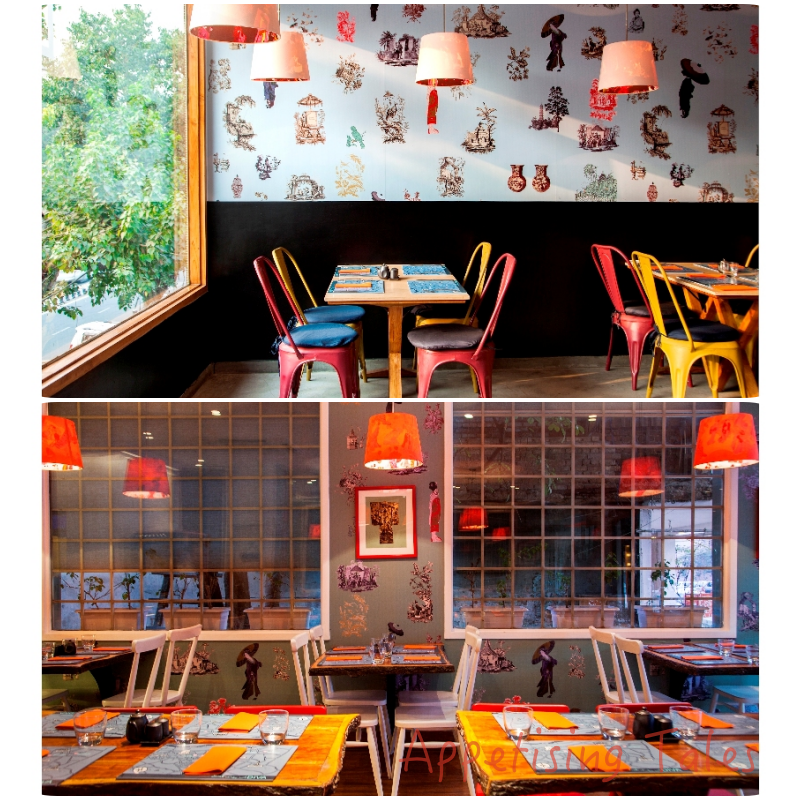 Diva Spiced has opened in the same space in Meherchand Market that earlier housed the French restaurant Chez Nini. Not only is the basic layout, along with the mirrored wall and bay windows, the same as the erstwhile restaurant but one even finds familiar waitstaff from Chez Nini, now serving Oriental fare with a smile of recognition. The muted colours of the former restaurant have however been replaced by brighter shades of yellow and red. And as with most Diva outlets, one finds Anita Damlia’s signature ceiling lamps bathing the restaurant in their warm glow. I appreciate restaurants that serve vegetarian fare that is delicious enough for non-vegetarians to order it as well. Most places fail on this account, but not this one. Inspired by Bomra’s in Goa, the Bomra’s Tomato Salad features “fresh tomatoes massaged with sesame, tamarind and jaggery dressing” according to the menu. Topped with crunchy peanuts and garlic chips this cold salad is mindblowing in its simplicity and certainly something that I’ll go back for. Unfortunately I can’t say the same about the Fresh Beetroot and Gaucamole Salad. Although I’m quite a fan of both beetroot as well as guacamole, the combination in this salad doesn’t quite work for me despite the added zing from the Thai red chillies and shredded coconut. 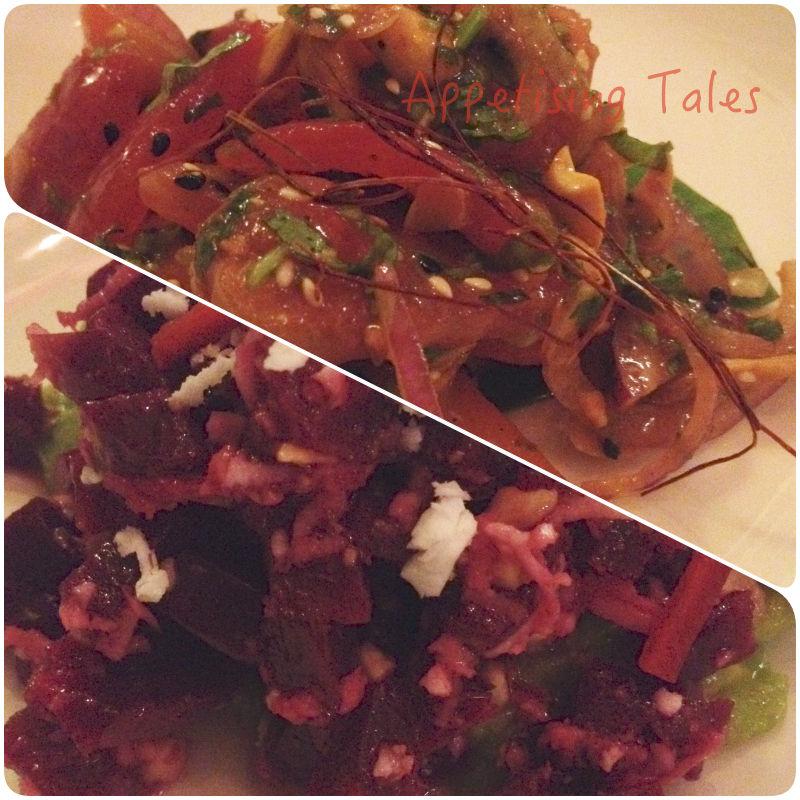 Top: Bomra's Tomato Salad; Bottom: Fresh Beetroot and Guacamole Salad. The choice of Asian Tapas is great, and if you order a few of these you can easily make a complete meal of it, without venturing to the mains. Although the Crystal Dumplings only offer four types each of vegetarian and non-vegetarian options I can assure you that there are no boring fillings. 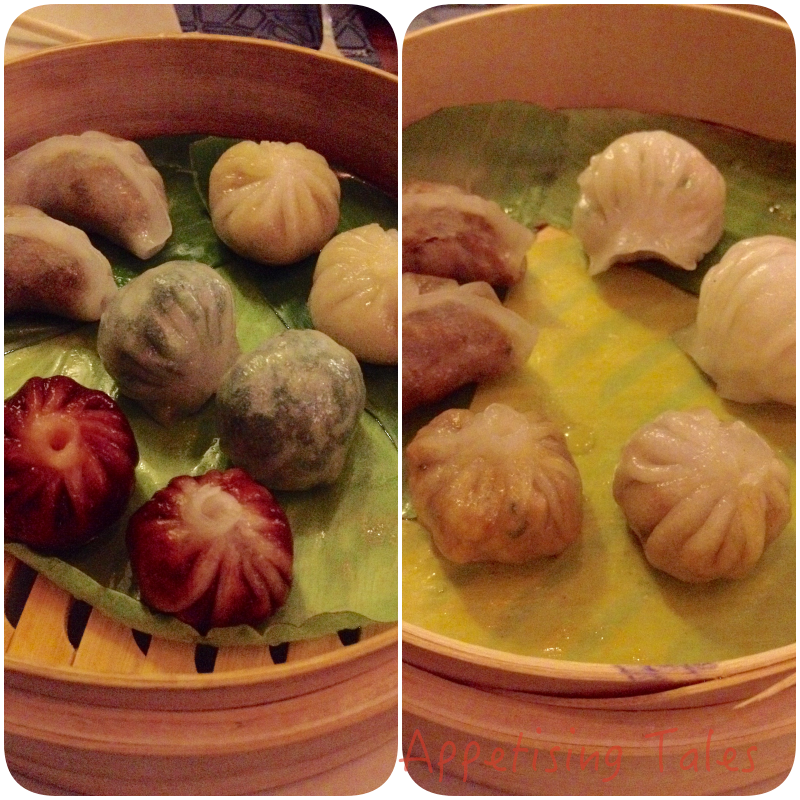 The thing about restaurants that do not specialize in dimsum often get the wrap all wrong. But you won’t find that at Diva Spiced. The thinly wrapped dumplings with liberal filling are made well and do not break; they are also a little sticky so they don’t slide off the chopsticks just before you put them in your mouth! I love the dumplings with Root Vegetables With Chili Oil and Chinese Greens, Asparagus And Garlic. From the non-veg dumplings, I really like the Pork Confit And Chilli, though I had no complains from the Prawn And Japanese Ginger or the Chicken Celery And Scallion as well. The other delicious offerings in the tapas menu are the croquet-style Fried Zucchini Flower filled with tofu and feta, Phyllo Pastry Samosa with glass noodles and shiitake mushrooms, the melt-in-your-mouth Pork Belly skewers, the fantastic Kerala style Calamari (I love the garlic pods and kadhi patta in this one) and Lepcha Special Chicken wrapped in homemade katifi (Lepcha being the chef who came up with this delicious appetizer!). 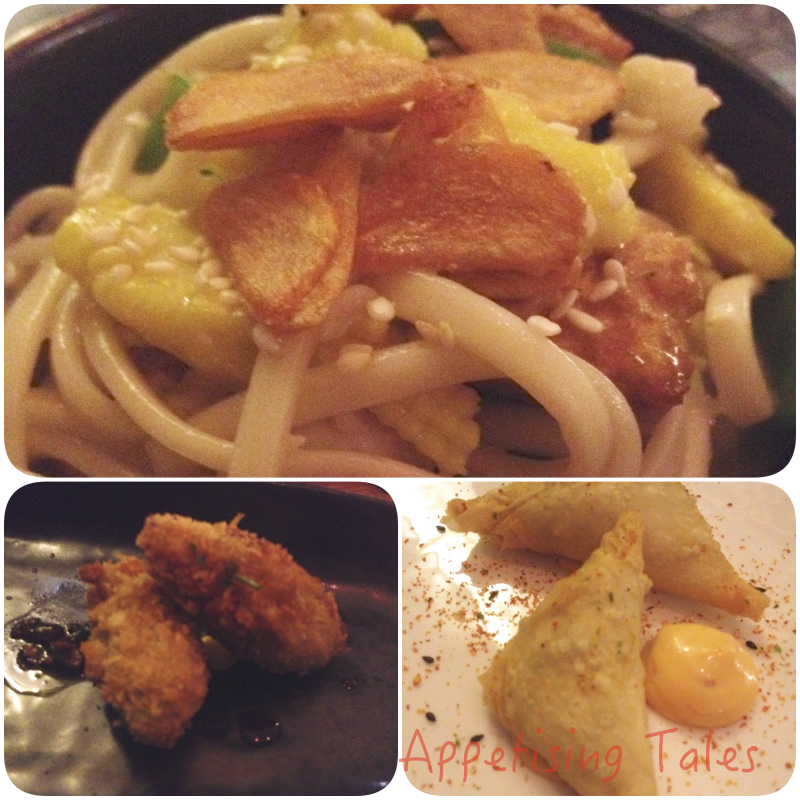 Top: Udon Noodles with Garlic Butter; Bottom Left: Zucchini Flowers; Bottom Left: Phyllo Pastry Samosas. The Rice and Noodle Bar is interesting. You can choose your veggies, tofu/meat, choice of noodles/rice and sauce for this meal in a bowl. While I have the udon noodles with vegetables and tofu in garlic butter sauce, you can pick from black bean, chili garlic, black pepper, soy ginger, bamboo shoot or laksa sauce. The mains offer a fairly extensive choice for vegetarians from a Young Papaya Curry to Caramelized Lotus Stem, Stuffed Baby Eggplant to a Red Curry and a Spicy Taro and Root Vegetable Burger. For non vegetarians, there’s a Chili Caramel Fillet of Sole with orange peanut Namjim and wokfried greens – my favourite from Diva Kitsch that shut down recently! I just love the combination of flavours and textures. The Maple and Chili Pork Ribs are served with wilted spinach and a kidney bean mash. While the overall flavour is great, I would prefer lesser fat on the ribs. 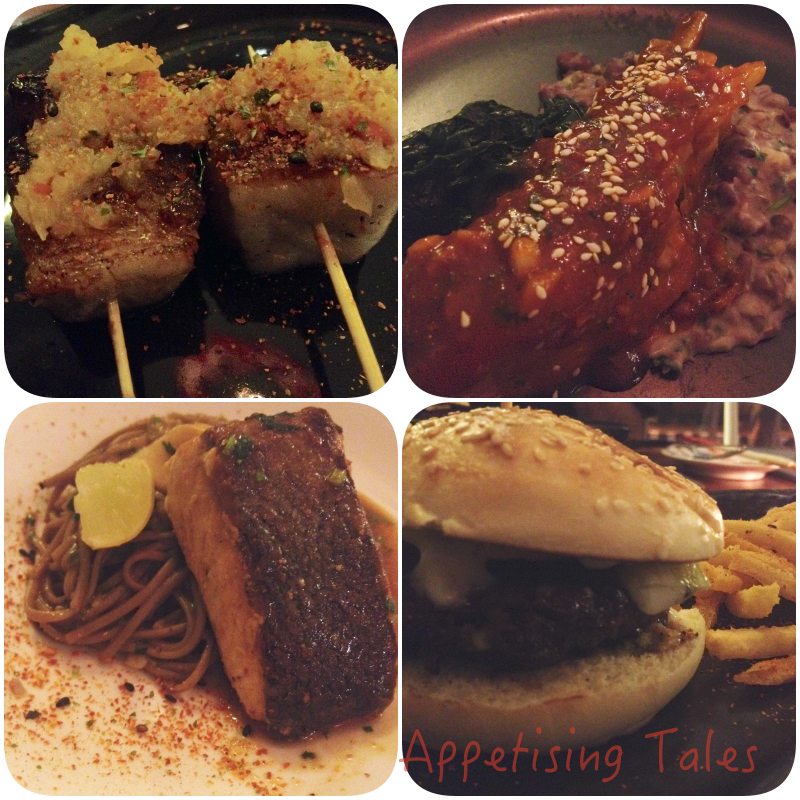 Clockwise from Top Left: Pork Belly Skewers; Maple and Chili Pork Ribs; Duck Burger; Broiled Salmon in a Miso Marinade served with Soba Noodles. Remember the Duck Burger from Chez Nini? Well, you’ll be happy to find it here, although with Chef Ritu’s twist it is served with a green apple chutney and pickled cucumbers. I find the new avatar to be bigger and juicier than its original version. There’s of course a lot more choice in the mains. I’d love to go back for the Goan Prawn Curry, New Zealand Lamb Chops with tamarind and port wine reduction and the Blackened Tiger Prawns with coconut chili rice and spicy mango relish. 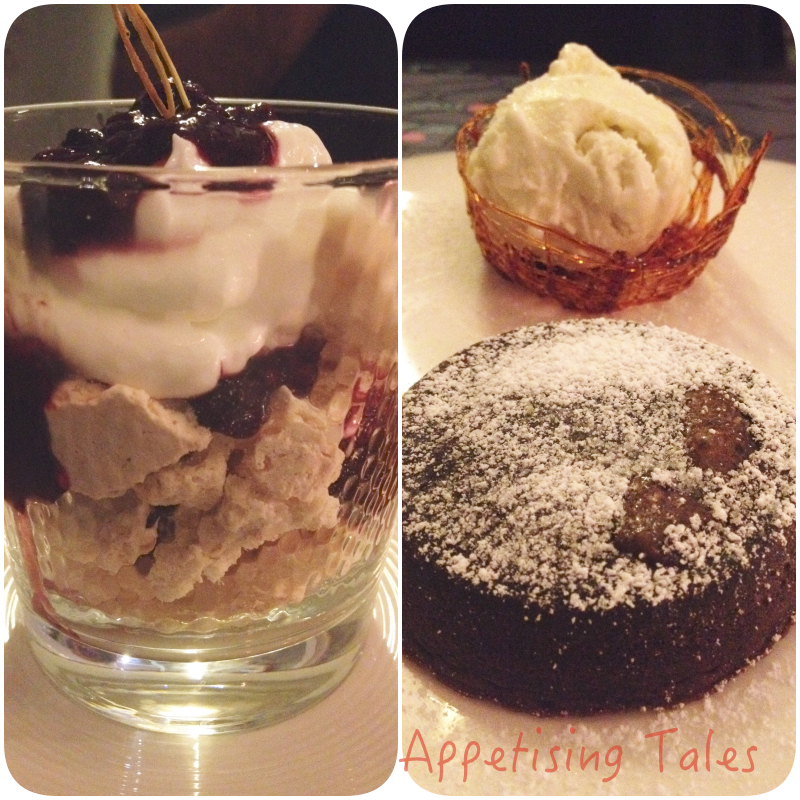 Left: Spiced Mess; Right: Black Pepper Infused Chocolate Fondant with Basil ice cream. I always look forward to dessert at any Ritu Dalmia restaurant. Although my favourite Tiramisu is not on offer here the Spiced Mess – Chef Ritu’s take on Eton Mess – features lemongrass meringue with mascarpone cream and berry compote. Heavenly, I say! Perfectly balanced, with no single element overpowering any other. And not being a huge fan of black pepper, I hesitatingly order the Black Pepper Infused Chocolate Fondant for the want of a chocolatey dessert. I’m glad that I can barely taste the black pepper but the accompanying basil ice cream is perfectly loaded with the refreshing flavour of the said herb. The casual yet buzzing ambience and enough delectable choice to not order the same dish each time I go back will definitely see me visiting Diva Spiced repeatedly. 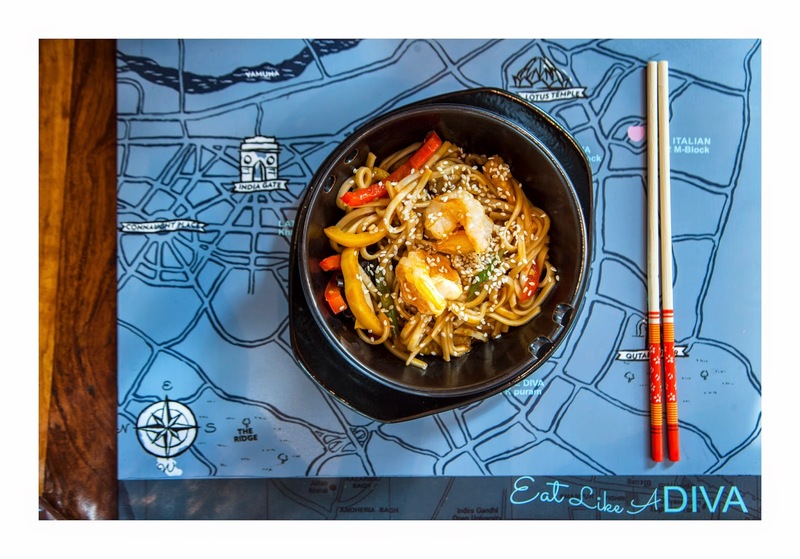 I love the table mats! Diva Spiced, 79-80, Meharchand Market (Ground & First Floor), New Delhi. Prices Tapas Rs 310 onwards; Mains Rs 540 onwards; Desserts Rs 395 each.